Hot chicken tortilla soup originates from Mexico. It is simple to make and sometimes other meats are used, such as lamb or beef and occasionally fish. The chicken is cooked on a tomato base and then you can add whatever you want, although traditionally this would include beans, corn, jalapenos, and cilantro. These ingredients are just suggestions, you can add or leave out whatever you want. This is a really simple dish to make. You can prepare it beforehand and then it will take just 30 minutes to cook. You can make the tortilla strips while the rest is cooking, or buy ready-made strips. They will just need to be fried for a minute on each side until they are brown and crisp. For the soup, start by slightly frying onions, garlic, and jalapeno until they become fragrant. If you want it less spice, remove the seeds from the jalapeno. Then add everything else you are putting in, including the chicken. Leave it to simmer for about 25 minutes and then take out the chicken pieces. Shred the chicken with a couple of forks and put back into the soup for the last five minutes of simmering. If you prefer your soup to be on the thick side, add some grated cheese and tortilla chips just for the last few minutes of the cooking time. It should be served with the tortilla strips but you can also have some fresh salad with it. Some people love it served with a drizzle of ghost pepper sauce, while others will put avocado, black olives or shredded cheese with it. It is a recipe that you can have something different with every time, although no doubt you will find your favorite. This is a very simple recipe to vary. You could cook it every night of the week and each time make it different. If you leave the cheese out, for instance, the soup will not be as thick and creamy but will still be delicious. If you do not serve it with tortilla strips it becomes a low carb variation. 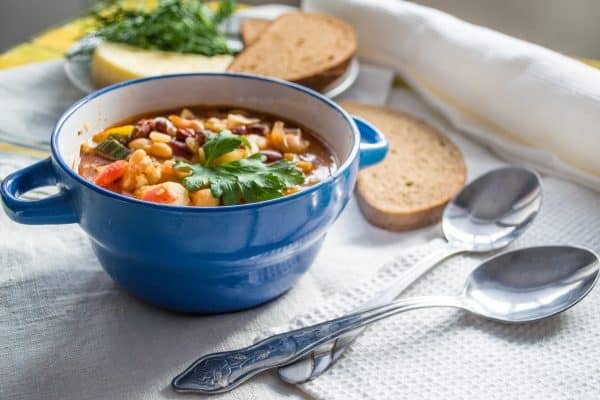 You can also just put all the ingredients into a slow cooker in the morning and by the time you are ready for your evening meal, it will be ready to enjoy. It freezes well too. You just have to be certain to thaw it at room temperature before reheating it. People lead such busy lives these days that they often turn to processed foods for convenience. Recipes such as this one though show that you can eat a very healthy diet without having to spend hours in the kitchen. This hearty soup is a family favorite. Make a double batch and freeze some for future meals. In a large soup pot or saucepan, combine first 15 ingredients. Bring to a boil. Reduce heat; cover and simmer 1 hour. Add corn; cook 10 minutes longer. Remove bay leaf. Top each serving with tortilla strips and shredded cheese blend.